Joyce Beatty was born on March 12, 1950 in Dayton, Ohio. She earned a BA in speech from Central State University in 1972, and an MS in counseling psychology from Wright State University in 1975. She also pursued some doctoral-level studies at the University of Cincinnati. In her post-college years, Beatty worked as the director of a rehabilitation center from 1970-74, a professor at Sinclair Community College from 1974-83, a professor at Capital University from 1979-92, and the executive director of Montgomery County (Ohio) Human Services from 1983-93. Since 1992 she has been the president of Joyce Beatty & Associates Inc., a consulting/training company. Beatty first became politically active in 1996 when she served as a delegate at the Democratic National Convention, a role she also filled at the 2000, 2004, 2008, and 2012 Conventions. In 1999 Beatty was appointed to succeed her husband, State Representative Otto Beatty Jr., who was retiring from the 21st House District seat he had long held in the Ohio state legislature. The following year, Mrs. Beatty captured 82% of the vote in the general election and won a full term in the State House of Representatives. In 2002 she ran for Ohio’s newly redrawn 27th House District seat and again won overwhelmingly—a feat she would repeat twice more, in 2004 and 2006. When term limits prevented Beatty from running yet again in 2008, she spent the next three years (2008-11) as senior vice president of Ohio State University’s (OSU) outreach-and-engagement office, a job that paid her a $320,000 salary, plus benefits. Because Ohio, at that time, used the three highest years of salary as the basis for calculating the pension payouts of its public-sector employees, Beatty, after leaving her job at OSU, began earning a state pension of $253,323 annually in 2012. Also in 2012, Beatty ran successfully for Ohio’s Third Congressional District seat in the U.S. House of Representatives, where she continues to serve (as a member of the Congressional Black Caucus). 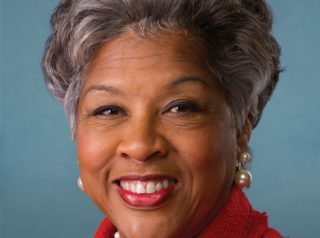 Between her congressional salary and her Ohio state pension, Beatty currently earns more than $425,000 per year. In August 2018, Beatty was a founding member of the Medicare For All Congressional Caucus, which promotes the implementation of a single-payer, government-run healthcare system. A longtime member of both the National Urban League and the NAACP, Beatty supports race-based affirmative action in public-sector employment and college admissions. voter ID laws are, by and large, racially motivated measures intended to suppress minority voting and should be eliminated. For information about Beatty’s voting record on an array of key issues, click here. Further Reading: “Joyce Beatty” (Votesmart.org, Ballotpedia.org, Keywiki.org); “State Lawmaker Joyce Beatty Headed for $320,000-a-Year Vice Presidency at Ohio State” (Cleveland.com, 9-17-2008); Congressional Pension Double-Dippers Club (by Carl DeMaio, May 2014, re: Beatty’s large pension and total income); Joyce Beatty’s Positions on Various Key Issues (OnTheIssues.org). Click for the results of Beatty’s Ohio State House of Representatives elections in 2000, 2002, 2004, and 2006.